Now it’s the Lliria dress’ turn to shine. For more than a year now I’ve been wanting to add a wrap dress to the Pauline Alice sewing patterns. It’s done now and I have to say I’m so happy as its romantic and nostalgic shape is exactly what I had in mind. 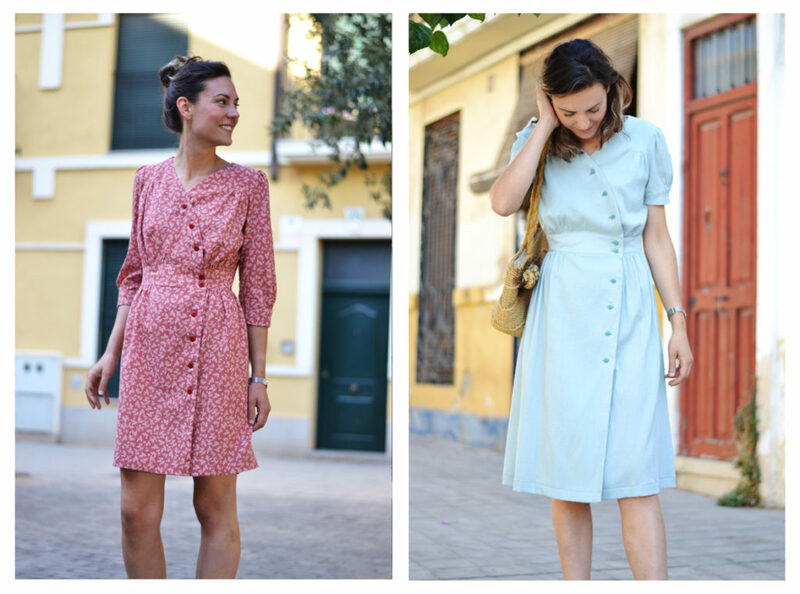 The Lliria dress is clearly inspired by the past, by the 40’s fashion to be precise, but it’s still contemporary and perfect for today’s life. 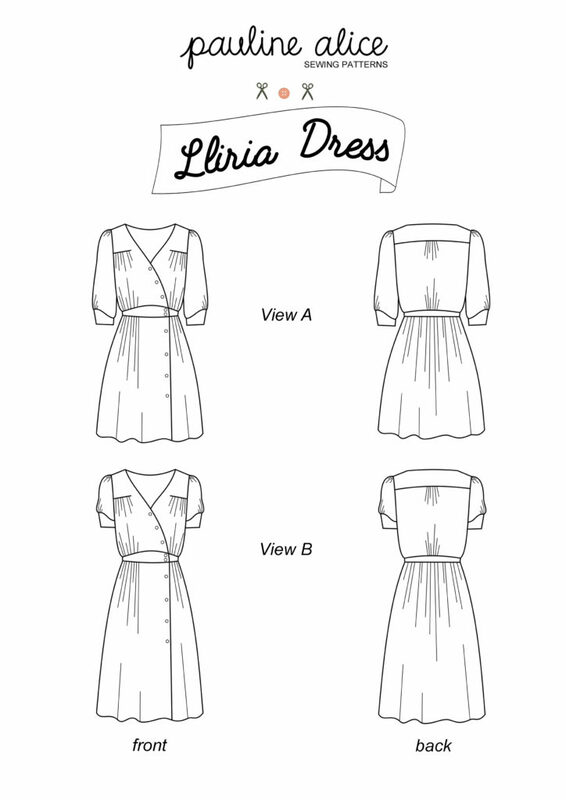 Lliria also offers two views: view A with ¾ sleeves and a short dress above the knee and view B with short sleeves and a midi length (below the knee). Topstitching can also be a strong feature on the Lliria dress (along the waistband, the darts, the back yoke, the sleeve cuffs…) and why not add piping to showcase the curved lines? For the Lliria dress, it’s very important to choose a lightweight and drapy fabric. Opt for cotton lawn, rayon, crepe, linen or silk. You’ll also need some interfacing for the waistband and 10 small buttons of approximately 1,5 cm (5/8”) wide. Note: for the presentation models, we have selected a rust rayon with small flowers for view A and a pale green crepe cotton for view B. 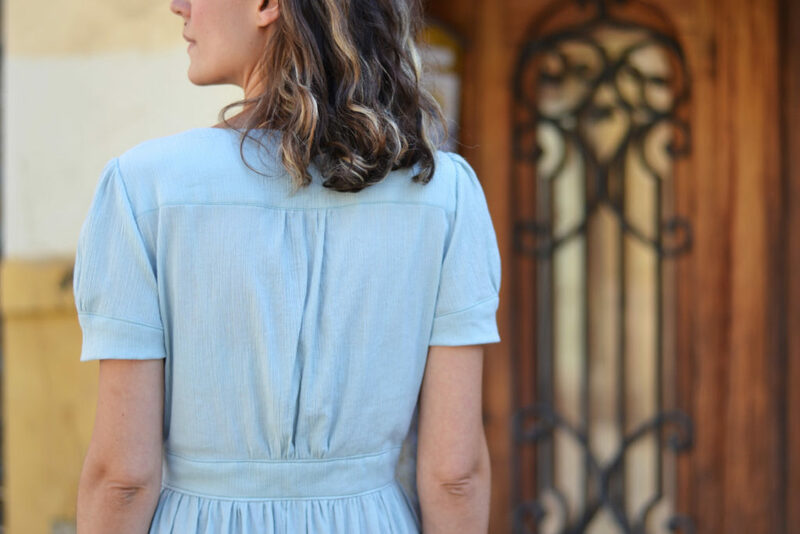 This light and feminine dress will be your summer staple, perfect for every occasion, from a summer wedding to a simple bucolic afternoon walk! We’ve worked hard to prepare a video tutorial following all the construction steps of the Lliria dress for next week. You can find the Lliria dress pattern in the shop in both printed and PDF version. Let me know: which one is your favourite? Lliria, Mirambell or both? I hope you’ll like the new patterns and that they will join your summer wardrobe very soon. See you next week for the tutorials! J’adore ces deux nouveaux patrons, bravo ! Je suis très tentée par la version A de Lliria et son côté années 40 très prononcé. Merci Carlotta! Ça y est, c’est rectifié!